Sept. 28 (UPI) -- The arctic hasn't been as warm as now for about 1,800 years and scientists are trying to establish how that will affect Earth's climate. The current spike in the region's weather far outstrips previously recorded warm periods in the medieval era, a study quoted in the Geology journal says. The study was funded by the U.S. National Science Foundation and the Keck Geology Consortium. 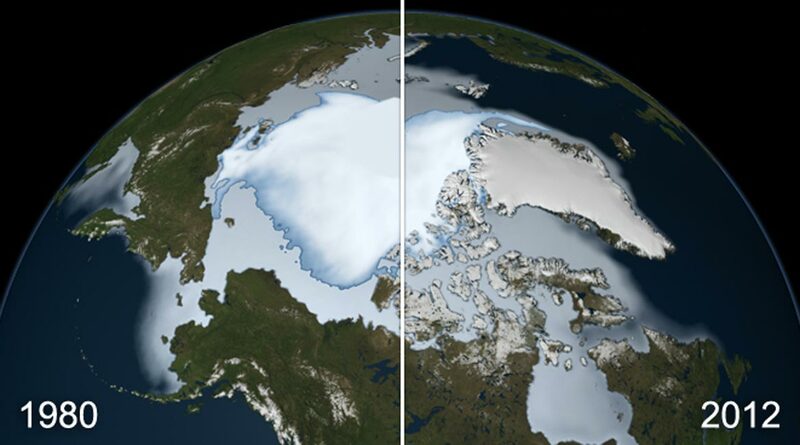 Recent measurements indicate the arctic is warming twice as fast as the rest of the planet, with sea ice this summer shrinking to its smallest extent on record. Natural feedbacks are amplifying the warming as loss of reflective sea ice causes the ocean to absorb more of the sun's energy, melting more sea ice, which causes more energy absorption, and so on. Climate models suggest that by 2100 the Svalbard Islands will warm more than any other landmass on Earth due to a combination of sea-ice loss and changes in atmospheric and oceanic circulation, a report from the International Panel on Climate Change said. In a study published last year in the Advances in Meteorology journal, Norwegian researchers estimated that average winter temperature in Svalbard could rise as much as 18 degrees Fahrenheit. The warming on the Norwegian archipelago of Svalbard is cited as a major example. Summers on the largely glacial land mass about 400 miles north of mainland Europe are warmer than at any other time in the last 1,800 years, including during medieval times when parts of the northern hemisphere were as hot as, or hotter, than today, says the study. "The Medieval Warm Period was not as uniformly warm as we once thought -- we can start calling it the Medieval Period again," lead author William D'Andrea said. D'Andrea, a climate scientist at Columbia University's Lamont-Doherty Earth Observatory, said, "Our record indicates that recent summer temperatures on Svalbard are greater than even the warmest periods at that time." Svalbard, midway between mainland Norway and the North Pole, was used as a whaling base in the 17th and 18th centuries, then abandoned until coal mining brought new human settlements at the beginning of the 20th century. Seabirds, polar bears, reindeer and marine mammals are usual inhabitants of the islands in the archipelago. The scientists say the naturally driven Medieval Warm Period from about 950 to 1250 has been a favorite time for people who deny evidence that humans are heating the planet with industrial greenhouse gases. But, they add, the climate reconstruction from Svalbard casts new doubt on that era's reach and undercuts skeptics who argue that current warming is also natural. Since 1987, summers on Svalbard have been 3.6-4.5 degrees Fahrenheit warmer than they were there during warmest parts of the Medieval Warm Period, the study says. Researchers produced the 1,800 year climate record by analyzing levels of unsaturated fats in algae buried in the sediments of Kongressvatnet Lake, in western Svalbard. In colder water, algae make more unsaturated fats, or alkenones; in warmer water, they produce more saturated fats. Like pages in a book, the unsaturation level of fats can provide a record of past climate. Most arctic climate records have come from ice cores that preserve only annual layers of cold-season snowfall and thus cold-season temperatures. But lake sediments, with a record of summertime temperatures, can tell scientists how climate varied the rest of the year and in places where ice sheets are absent. "We need both ice core and lake sediment records," glaciologist Elisabeth Isaksson said. Isaksson, who works at the Norwegian Polar Institute and wasn't involved in the study said the findings tell "a different, more detailed story." In looking at how summers on Svalbard varied, researchers also discovered that the region wasn't particularly cold during another recent anomalous period -- the "Little Ice Age" of the 18th and 19th centuries. At that time, glaciers on Svalbard surged to their greatest extent in the last 10,000 years and glaciers in many parts of Western Europe also grew. More snow, rather than colder temperatures, fed that growth of Svalbard glaciers. Evidence from tree rings and ice cores shows that southern Greenland and parts of North America were warmer from 950 to 1250 than today, with the Vikings taking advantage of ice-free waters to settle Greenland. Some regions also saw prolonged drought, including California, Nevada and the Mississippi Valley, leading some scientists to coin the term Medieval Climate Anomaly to emphasize the extreme shift in precipitation rather than temperature. A natural increase in solar radiation during this time was responsible for warming parts of the northern hemisphere, with a rise in volcanic activity from 1100 to 1260 that caused milder winters, University of Massachusetts scientist Ray Bradley said in a 2003 Perspective article in Science. Bradley is a co-author of the Svalbard lake sediment study. Other co-authors include David Vaillencourt and Nicholas Balascio of the University of Massachusetts, Amherst, Al Werner from the Mount Holyoke College, Steven Roof from the Hampshire College and Michael Retelle from Bates College. Western Svalbard warmed gradually starting in 1600, the researchers said, when the northern arm of the Gulf Stream, known as the West Spitsbergen Current, may have brought more tropical water to the region. In 1890, the warming began to accelerate, with researchers attributing most of the warming since about 1960 to rising industrial greenhouse gas levels. Ice cores from Svalbard, by contrast, show a slight cooling over the last 1,800 years. The conflicting evidence suggests that temperatures may have fluctuated more sharply between winter and summer, said Anne Hormes, a quaternary geologist at the University Centre in Svalbard who was not involved in the study. D'Andrea and other scientists dated their lake cores by analyzing grains of glass spewed by volcanoes hundreds of miles away in Iceland. Those past eruptions -- including Snaefellsjokull in 170, Hekla in 1104 and Oraefajokull in 1362 -- left unique chemical time markers on Svalbard's lake sediments. "We know fairly precisely when these eruptions occurred, which is rare in the geologic record," said Balascio. The Earth Institute at Columbia University mobilizes the sciences, education and public policy to achieve a sustainable earth. Through interdisciplinary research among more than 500 scientists in diverse fields, the institute says it is adding to the knowledge necessary for addressing the challenges of the 21st century and beyond. The Lamont-Doherty Earth Observatory at Palisades has more than 300 research scientists involved with the study the planet.